There are a few things that I learned (in no particular order) and I’ll let you decide if they’re good, bad, or neither. 1. No matter how much food you pack and what you plan someone will complain that there is nothing to eat and want to go to the store. 2. You tell everyone to pack for 9 days. Do laundry while you’re camping and they still run out of clothes. 3. Toddlers never leave their shoes on. Never. No matter what you say. 4. When toddlers take their shoes off they lose them. Yes, lose them…. meaning my son doesn’t have tennis shoes and I have to go replace them. 5. As soon as I replace the lost tennis shoes they’ll turn up. 6. Even when you’re camping on grass, no sand/dirt in sight, and a paved road kids still look like they rolled in dirt by dinner time. 7. Campers hold a very small amount of hot water and kids need a bath almost every single night. 8. Your parents will let your kids get away with just about everything they didn’t let you do. This isn’t new though, right? 9. Even the biggest camper seems small with 6 people after a few days. 10. 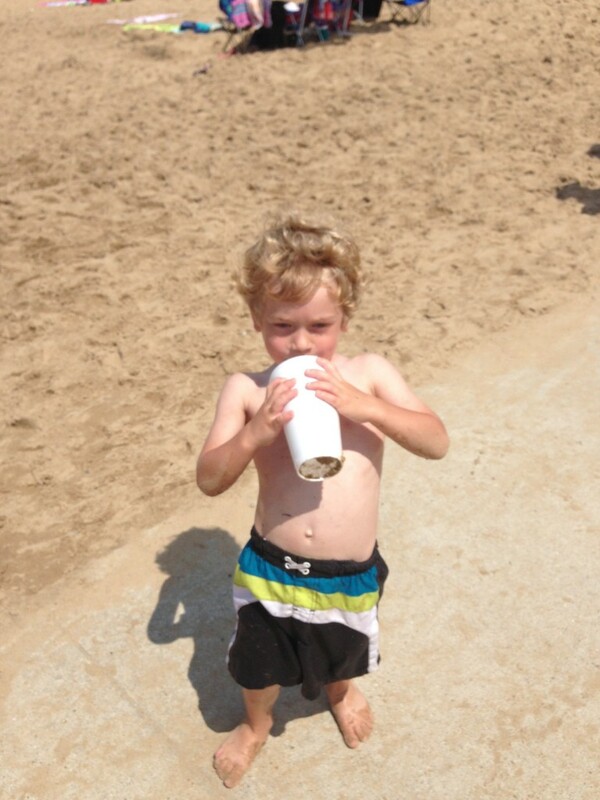 Best part about camping… spending the day at the beach. 11. Worst part about camping… being in a location where there is no internet access, no 4G, and barely enough edge service to send a text message. Thanks AT&T. Overall it was a pretty good week because I was able to spend some quality time with my parents and my sister came home with her boys. And yes, it wasn’t all that bad disconnecting like that because I was able to spend a little time with my kids, my parents, and read two books. So, now I play the catch up game. What’d I miss? Well, this post is a lot later than it should be but…. Oh well! An entire week of no work except the normal cooking & cleaning that comes with camping. Hmm… maybe I should revisit what a vacation really is because I don’t think that cleaning is in the definition of it. I’ll be checking in because going off line completely is hard and I’ll get withdrawals. Hi! Well, I made it through Animal Kingdom and today I’m off to Disney Hollywood Studios! Today I have the amazingly talented Erica here and she is sharing some of her tips for traveling with a baby. I’ll admit that I never traveled with my kids as babies until I had Andrew and it’s no easy task that’s for sure. Thank you Erica for guest posting today while I’m off enjoying my vacation! This is the time of the year most of us start dreaming of vacation. And, if you are like me – a working parent with 2 kids – vacation cannot come soon enough. For us, tips for traveling with a baby include one thing: Know where every hospital and / or emergency room is. This story is how I came to that learn that gem. Our 7 hour-ish car ride to the Outer Banks, North Carolina, began with an overnight stop in Chincoteague, Virginia. We were bored with the downtown within 5 minutes enjoyed the small town quaintness of Chincoteague. I scarfed down many blue crabs while getting my hands covered in Old Bay Seasoning We had a lovely dinner at the local crab shack. And managed so see some of the famed ponies enjoying the natural beauty of the island. Oh, and we had the crap bitten out of our legs by mosquitoes, which, of course, is expected in Chincoteague. The next morning we planned to wake up early for a beach stroll before beginning the second leg of our journey down to the Outer Banks. Then my daughter fell face down off the hotel bed. Face down. She had to go to the hospital. I called down to the receptionist. An hour? Where the heck were we anyway??? Oh yeah, Chincoteague. Why didn’t someone share with us tips for traveling with a baby and let us know we needed to stay within 15 minutes of a hospital?? Our daughter was finally calmed down, and we packed the car to go to Nassawadax, which, by the way, looks exactly like you would picture a town called Nassawadax, Virginia to look like. Chicken farms and boarded up gas stations. She checked out fine… of course. Any change in behavior, we should come back. She had a shiner, and some rug burns, but other than that… she was good to go. Um… great, thanks… yeah, the 24-hour grocery store will probably have what we need. Awesome. Can we go now? We were also told it’s good luck for your child to fall off the bed before she is a year old. I guess this happens often enough for a wives’ tale about it. SO… what has your kid done to make you scare the heck out of you? What toddler moment sent you to the ER?? What tips for traveling with a baby would YOU include? 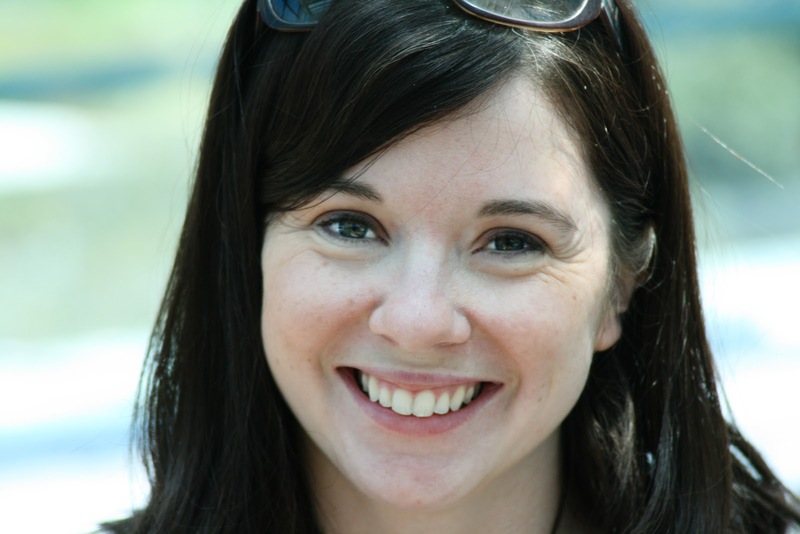 Erica Voll is a freelance writer, blogger, and social media consultant. She writes a parenting blog, No Sleep ’til College, and is co-founder of Girls’ Lunch Out. Erica rarely sleeps. Thank you Emmy for guest posting today while I’m off enjoying my vacation! Today I am visiting Animal Kindgom down in Orlando and having lots of fun! But I have Emmy here today and she is sharing her boycation memories with you. Boycation… this is new word to me and I hope that it’s something that I never, ever have to do with my girls! 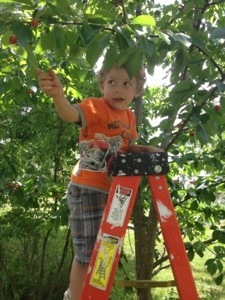 Emmy… your mom was great for doing this! Not sure what I’m talking about? Read on! What is your dream vacation? When I was younger growing up in the Midwest, I dreamed of an exotic vacation to a place with a magical mouse called Disney World. Then the dreams changed to vacations to another country or tropical island. Now as a mom, sitting on a beach by myself reading a book would be enough for me! Why do you go on a vacation? To visit family, to get away, to see something new? As a child I never did make it to Disney World or an exotic island. 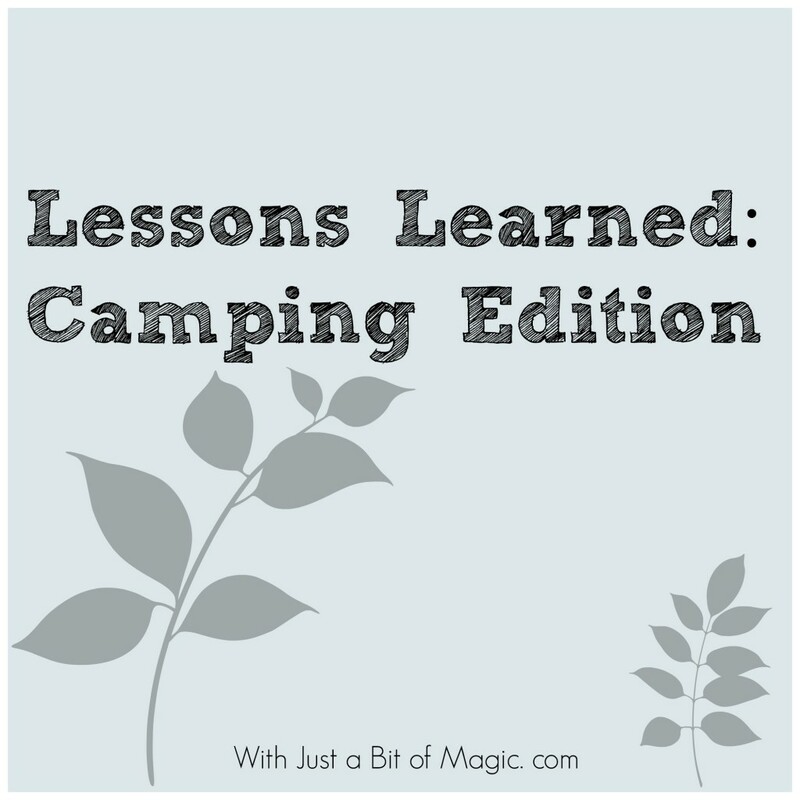 Our vacations usually consisted of loading all 8 of us into our over sized van and driving cross country to visit grandparents or loading all 8 of us into the van so we could all cram into a tent while camping in an extraordinary destination called “Wisconsin”…. Yeah. But then, there were the vacations for boys. No, not for my brothers- but boys, boys I liked. There was this cool new thing called the Internet. I remember sneaking upstairs to get on the computer; though sneaking was futile as these were the days of dial-up, everyone and their dog knew I was on the computer when that started up. I had my own email address and was dying just to get an e-mail, it was so fascinating and new. I even found a site for making friends, created a profile and was soon chatting with a nice teenage boy from Wisconsin (ironic much). Soon we were e-mail chatting back and forth, I would write a sentence hit send, wait for his reply, he would write back; we did this for hours. We decided we really wanted to meet. I don’t remember how in the world we managed to talk both of our parents into the fact that it would be a good idea to meet, but soon it was arranged. My mom, my little sister and I made the several hour drive across the state boarder to Wisconsin to meet this mysterious guy. I know!! Now as a mother myself, even typing this makes me shudder. What was my mom thinking?? What was I thinking? Well I know what I was thinking, I was a teenage girl–so I wasn’t. Thankfully he was just who I thought he was and we had a great time together. We stayed at his family’s house and they were all super kind and nice. Time and distance and his mom being scared we liked each other too much ended that relationship. This was the first of many “boycations”. There was the trip to Ohio to see the boy I met at a church youth conference, there were the boy(s) I drove out to Indiana to see, there was even this one crazy guy and his brothers who drove all the way from Oregon to meet me and of course my long distance boyfriend in Missouri. Oh teenagers. Sometimes it amazes me that I made it through my teenage years intact. Relaxation, family, chance to see new exotic places, and of course boys isn’t that what vacations are all about? Thanks Jackie for letting me take over your place today! I hope you have a wonderful time at Disney, my childhood self is very jealous. Emmy is a full-time mom, part time professional photographer who blogs about life, photography, crafts, and the crazy things her kids do at Emmy Mom-One Day at a Time. She co-hosts a weekly meme called Proud Mommy Moments where you can tell about the proud and not so proud moments of being a parent. She tries to find the humor and good in life with a glass half-full approach. A couple weeks ago we took a vacation in Mackinaw City at a local campground/resort that we can always seem to get into no matter how long we wait to make reservations. 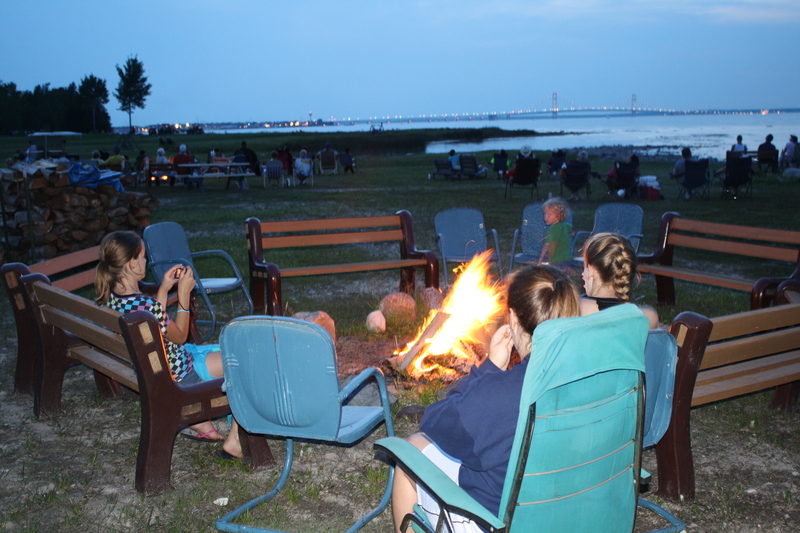 It’s a practically perfect place with the campsites facing the water and great views of the Mackinac Bridge & Island…. the only thing that keeps it from being perfect is all the rocks that are in the lake (water shoes are a must). There was always a gentle breeze coming off the water and you can hear the sound of the waves crashing on the beach and evening bon fires on the beach where everyone could gather round and share their day along with some delicious s’mores. Our days weren’t just spent laying around the beach enjoying the beautiful view though! We took off and played tourist in our own state and headed up to the U.P.! 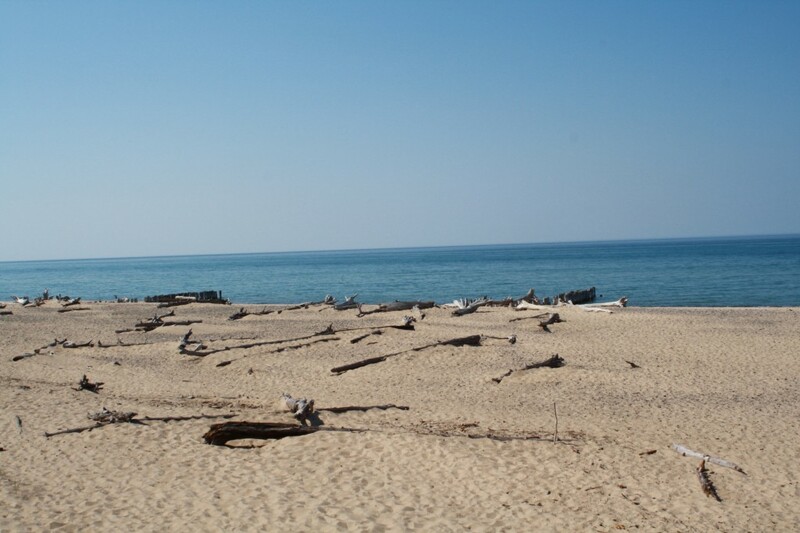 Our first stop was at Whitefish Point on Lake Superior. The water here is crystal clear and as cold as ice…. it’s one of the great lakes that really never warms up and is home to many ship wreaks and the ship wreak museum. Just going there to spend some time on the beach is worth it because it is such a beautiful place and worth the drive. But if you decide to go into the museum (which you should) this is one of the items that you’ll be impressed with… and the main reason that we went because my youngest daughter really wanted to see it. 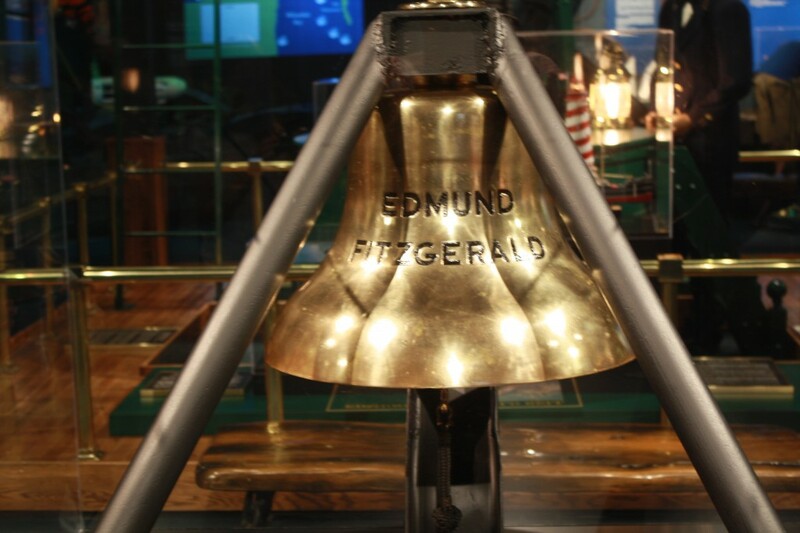 This is the bell that was pulled up from the Edmund Fitzgerald that sunk in 1975…. I’m sure that if you’ve ever listened to the radio you’ve heard the song about the ship wreak made famous by Gordon Lightfoot. 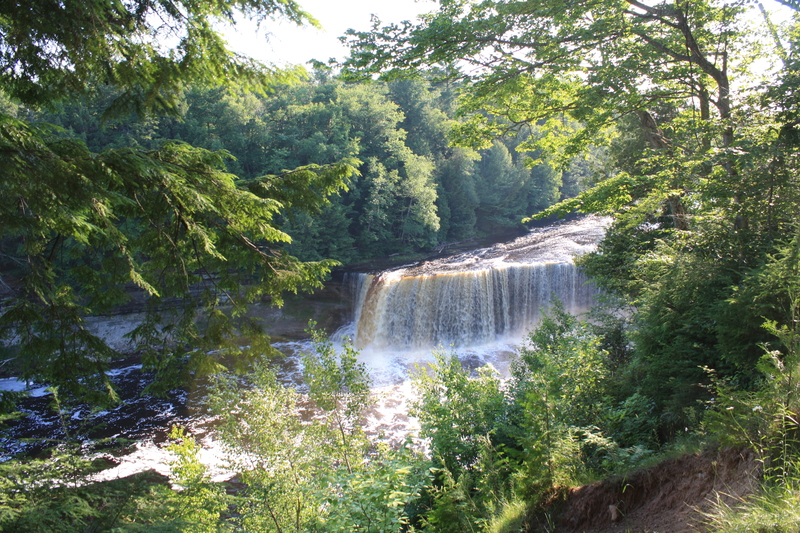 Our next stop on our trip was Tahquamenon Falls.. or just the upper portion since the kids were getting tired and hiking wasn’t something that they wanted to do more of that day. Just a fact or two for you… the upper falls is one of the largest waterfalls east of the Mississippi and has a drop of nearly 50 ft and is more than 200 ft across. I just like going to take in the beauty of it and to hike the trails that follow it. When were were there it was hot but there was a cool breeze coming off through the gorge and you could smell the pine trees…. it was such a clean, fresh scent. A smell that tells you that you are truly up north! 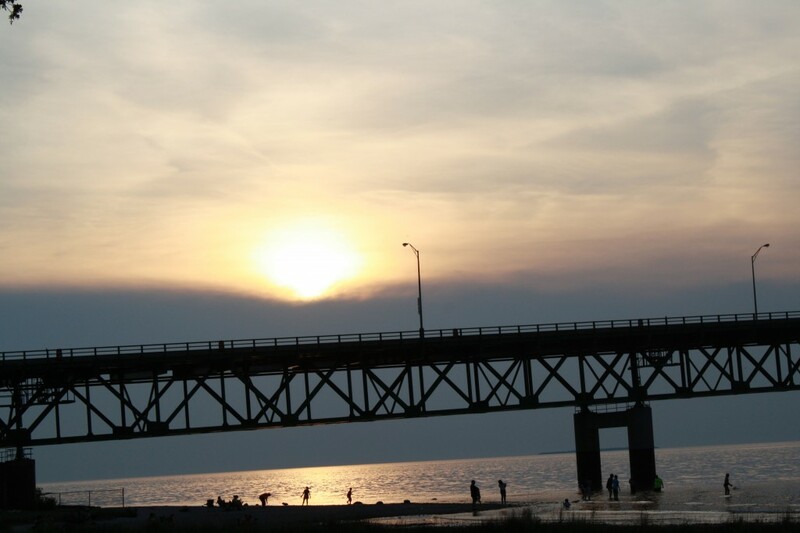 I leave you with one final picture… the evening sunset over the Mackinac Bridge. Have taken a family vacation yet? What did you do? Guess what…. of course it’s Wednesday and I’m linking up with Angie from Seven Clown Circus and Amanda from Parenting by Dummies!